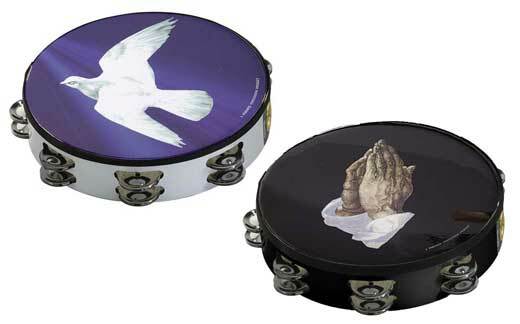 Order your Remo Religious Tambourines from AMS and enjoy Fast & Free Shipping. Get the Best Deal with our Lowest Price Guarantee & Great Customer Service! The Remo Religious tambourines feature a colorful graphic on a pretuned drumhead that may be used to show a reflection of your passion and praise. Features an Acousticon shell and laminated design (that doesn't wear off!). These tambourines each have either a single row of 8 jingles or a double row of 8 jingles. Was smaller than I thought I was ordering but still will continue to use it. I really like this tambourine. It is well balanced and durable. It has been a great asset to our worship services. It's too big , next time i'll order a smaller one . I bought it as a gift , it's nice but the recipient thinks it's too big. my childeren, first lady, and spiritual mother all loved the tamborines. they are of good quality and make a joyful noise. its a must have for any praise service!! !